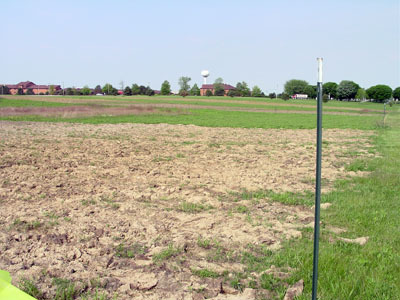 the experimental plots for the soil disturbance experiment. the spring, 2005 prairie burn. from the fire charring. Green access roads traverse Plots #3 and 4. In response to the prairie fires of 2001 and 2003, Indian Grass and Tall Goldenrod gradually assumed dominance as measured by percent cover. See "Prairie Trials by Fire." 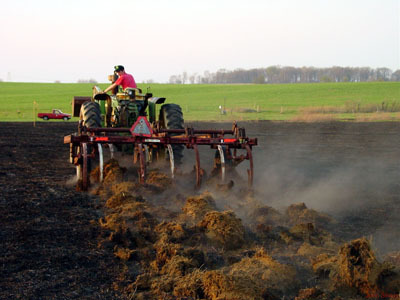 Disturbance of the top 5-10 cm of soil by chisel plowing followed by hand seeding of prairie plant species will reduce the dominance of the Indian Grass (Sorghastrum nutans) and Tall Goldenrod (Solidago altissima) and create new soil space in which seeds of desired prairie species can germinate and grow. We divided an approximately 7-acre portion of the Prairie Restoration Site into seven, 1-acre plots (aerial photo on top left). The entire area was burned, in Spring of 2005, to remove organic residue. 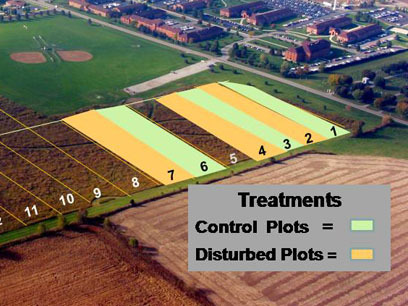 Then, plots #1, 3, and 6 were designated “control” plots and did not receive further treatments. Paired with these plots, respectively, were plots #2, 4, and 7 designated “disturbed” plots. 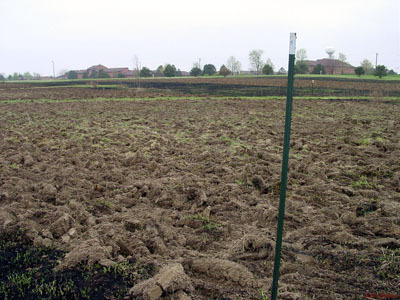 Each of these were adjacent to one of the “control” plots and served as the “Disturbed” plots which were subjected to chisel plowing and light disking; and, seeding treatment (left, middle photo). Seeds were hand-sown on the still-rough gound which was then cultipacked to encourage burial of the seeds and to stabilize the soil (left, bottom photo). The growth response within weeks is shown in the photo below. We performed a vegetative cover analysis in September and the results are discussed on the next page, "First Year (2005) Response." in the distance as brown strips between green "control" plots.